This project was created on 04/26/2015 and last updated 2 years ago. A 3d printed enclosure to house multiple Pis. The original idea was somewhat like enterprise blade server - a chassis that takes care of power and network distribution, with processor modules that can be easily added and removed. The recently released Raspberry Pi 2 features a quad core ARM processor, so they&apos;re very capable little machines for $35. Low energy usage (compared to a regular linux server) and fanlessness make them ideal! You can download the 3d models here, created with SketchUp. To print, you&apos;ll need the STL Plugin to export a format that most 3d-printing host software likes. All the pieces (along with some prototype and test models) are in the one document. The bottom most layer of the Pi Rack mounts an ethernet switch and some simple connections to bring power up to the Pis. Wanting to keep things simple, I decided to use an ATX power supply for now, as they provide a steady 5v power source good enough for computers, so powering a Pi would be no effort. The 3d printed bottom piece has recesses for the molex connector and a piece of prototype board (it&apos;s oversized because I wanted space for future additions - maybe a simple fan controller if needed). All that&apos;s really here is a SIP socket that power/ground is connected to. To connect to the power-providing SIP socket, this little right angle breakout board provides a pin for each PI, the jumpers are simply plugged into this. I also cut the switch&apos;s original power supply cable and resoldered it here so its powered entirely from one supply. What&apos;s neat about this is I can experiment with different power sources in a fairly modular way - just need a 6 pick SIP socket. All that&apos;s left is to flip the base over and bolt it in place! An opening gives easy access to the ethernet connections, and spare ports for the uplink. The core of this project is figuring out how the Pis will slide into place and have all the necessary ports line up and make contact. Designing the sled gave me a firm grip on the capabilities of my printer, so creating the backplane was next. Having little 3d modeling experience, I turned to the simplest tool available: SketchUp. I found a reasonable accurate model of the Pi B+ online, so I used that to mock up the enclosure. Label 1 is a housing for the ethernet plug. 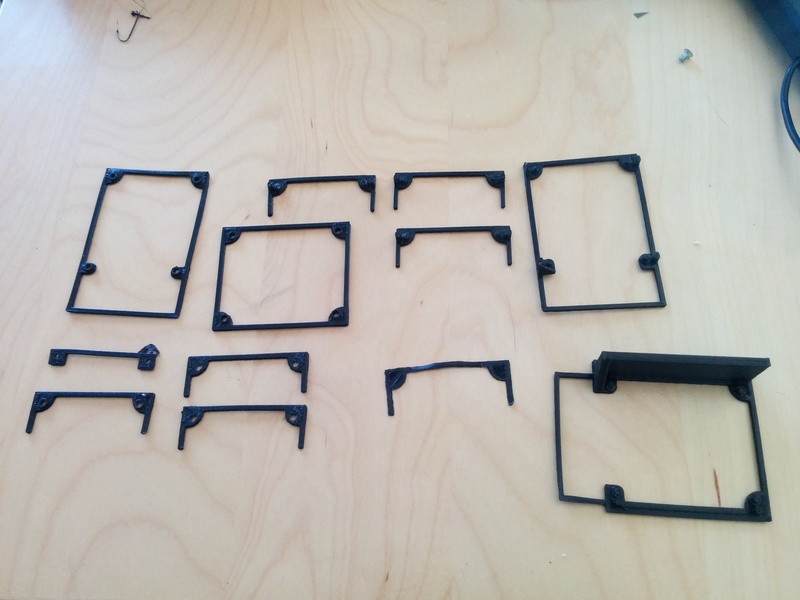 Originally I planned to epoxy these into place, but force-fitting them into the 3d printed model seems sufficient. My cheap printer tends to round corners but in this case it only helps hold the RJ45 connector in place. Label 2 is a U-shaped holder for two more breadboard jumper wires, the female end of which is glued in place. The power and ethernet wires all run down through the hole at Label 3, down to the layer where the ethernet switch sits and power will be distributed. The vertical back is fixed to the top/bottom layer with a tongue and groove. I think I like this routing of the ethernet wires, they&apos;re a little more protected than the original design. There&apos;s room for some simplification here - I could have omitted two twisted pairs of each ethernet run here too - the Raspberry Pi only supports 10/100 lan, which only needs 4 wires - only gigabit ethernet uses all 8. In fact, my switch is only 10/100 as well. But I left them in under the idea of futureproofing. I would LOVE to see a Pi with gigabit support someday. Each Raspberry Pi sits on a custom 3d-printed sled. The original model B/B+ and the Raspberry Pi 2 have an identical form factor, so it works for both! The sleds are completely screwless - pegs printed into them fit the RasPi&apos;s mounting holes, and little clips hold the Pi in place. This is my first adventure into 3d printing, and getting the sled just right took literally a dozen iterations. To figure out what my very low end 3d printer was capable of, figure out the easiest way to mount a Pi, how to run the power, etc. I was looking to build an RPI blade server when I found your project. I like it! How are the bays hot-swappable? Do you implement a software shut-down in case of sled removal? Have you considered additional circuitry on the sled to handle this and other functionality? Hmm I wish there were a 3D printer that you could toss your scraps into to reuse! Anyway... I am planning on implementing this rack... once I fully understand it I would like to enhance it by designing and printing rear transition modules for the USB, as well as serial, camera, I2C and SPI connections (maybe plumb out the Ethernet to a USB connection as well). what's that on the bottom? Power supply? Or a switch/hub/router? Looks like it could also be made out of wood. What do you do with 5 raspis? Is one missing? what is that, sawdust mixed with plastic? The larger board on the bottom is a switch, the smallest I could find - http://www.amazon.com/dp/B0034CL3MA/ . The smaller prototype board is just a junction for where power (Provided by an ATX power supply) is split off for the 6 PI slots, and the switch. You absolutely could use wood for the layers and sides, be it 3d printing (I've never heard of doing this with wood?) or traditional woodwork, if you have a router to cut the slots and square holes. You are about to report the project "Raspberry Pi Rack", please tell us the reason.